The Duck Dodgers TV series — based, as if you didn’t know, on the Chuck Jones-directed cartoon Duck Dodgers in the 24th 1/2 Century — ran on Cartoon Network from 2003 to 2005. [My, was it really that long ago? 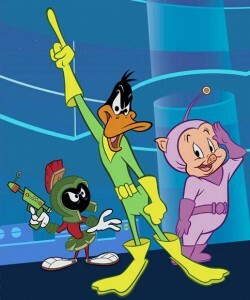 Sheesh... Ye ed-otter] Besides the obvious cast of Daffy Duck as Duck Dodgers, Porky Pig as The Eager Young Space Cadet, and Marvin the Martian as the terrible Commander X-2, the show featured a host of Warner Brothers characters in bit roles — not to mention new characters like the dreaded Martian Queen. The regular voice cast included well-known voice actors like Joe Alaskey, Bob Bergen, Richard McGonagle, and John O’Hurley, as well as Michael Dorn (from Star Trek: The Next Generation) and Tia Carrere (as the Martian Queen). Now Warner Brothers Home Video have (finally!) released the first 13 episodes on DVD in a collection entitled Duck Dodgers – Season 1: Dark Side of the Duck. It’s available now in stores and on-line everywhere. The people of the dying planet Mars need a savior. Someone to free them from the evil forces destroying their world. In desperation they reach out to the blue planet, Earth, for aid. What they get is… a sasquatch. Seriously. 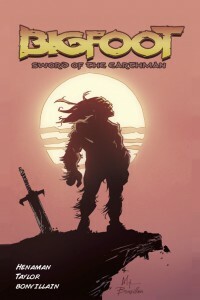 That’s the premise of Bigfoot: Sword of the Earthman, a new full-color comic book series written by Josh Henaman. It’s illustrated by Andy Taylor and Thomas Bonvillain, and published by Brew House Comics. You can check it out at Josh’s official Bigfoot web site. The Cartoon Brew website has just posted this two-year-old eight-minute film by Swedish animator Jacob Stålhammar; written in 2004, painted in gouache on cardboard, and animated in limited animation to a public domain stock music score. Arguably less an animated cartoon than an animated children’s picture book. Still anthropomorphic.